Earn a rating of Incredible while Bilging. Earn a rating of Incredible while Sailing. Earn a rating of Incredible while Navigating. Earn a rating of Incredible while Gunning. Complete an Incredible session of Blacksmithing. Earn a rating of Incredible while performing Carpentry. Complete an Incredible session of Alchemistry. Earn a rating of Incredible while Rigging. Complete an Incredible session of Shipwrightery. Complete an Incredible session of Weaving. Earn a rating of Incredible while Treasure Hauling. Complete an Incredible session of Distilling. Complete an Incredible session of Foraging. Reach Broad experience in Alchemistry. Reach Broad experience in Swordfighting. Reach Broad experience in Navigation. Reach Broad experience in Shipwrightery. Reach Broad experience in Poker. Reach Broad experience in Treasure Haul. Reach Broad experience in Rumble. Reach Broad experience in Foraging. Reach Broad experience in Gunning. Reach Broad experience in Treasure Drop. Reach Broad experience in Rigging. Reach Broad experience in Spades. Reach Broad experience in Blacksmithing. Reach Broad experience in Carpentry. Reach Broad experience in Drinking. Reach Broad experience in Sailing. Reach Broad experience in Battle Navigation. Reach Broad experience in Bilging. Reach Broad experience in Hearts. Reach Broad experience in Distilling. Reach Broad experience in Weaving. Reach Expert experience in Blacksmithing. Reach Expert experience in Drinking. Reach Expert experience in Rigging. Reach Expert experience in Gunning. Reach Expert experience in Treasure Haul. Reach Expert experience in Navigation. Reach Expert experience in Sailing. Reach Expert experience in Carpentry. Reach Expert experience in Poker. Reach Expert experience in Shipwrightery. Reach Expert experience in Battle Navigation. Reach Expert experience in Distilling. Reach Expert experience in Weaving. Reach Expert experience in Treasure Drop. Reach Expert experience in Bilging. Reach Expert experience in Spades. Reach Expert experience in Foraging. Reach Expert experience in Rumble. Reach Expert experience in Swordfighting. Reach Expert experience in Alchemistry. Reach Expert experience in Hearts. Reach Sublime experience in Drinking. Reach Sublime experience in Bilging. Reach Sublime experience in Sailing. Reach Sublime experience in Foraging. Reach Sublime experience in Gunning. Reach Sublime experience in Hearts. Reach Sublime experience in Rumble. Reach Sublime experience in Weaving. Reach Sublime experience in Shipwrightery. Reach Sublime experience in Alchemistry. Reach Sublime experience in Navigation. Reach Sublime experience in Swordfighting. Reach Sublime experience in Rigging. Reach Sublime experience in Distilling. Reach Sublime experience in Poker. Reach Sublime experience in Carpentry. Reach Sublime experience in Treasure Drop. Reach Sublime experience in Battle Navigation. Reach Sublime experience in Treasure Haul. Reach Sublime experience in Spades. Reach Sublime experience in Blacksmithing. Achieve ocean-wide Ultimate standing in Alchemistry. Achieve ocean-wide Ultimate standing in Drinking. Achieve ocean-wide Ultimate standing in Rigging. Earn the Ultimate Pirate, Ultimate Carouser and Ultimate Crafter achievements. Achieve ocean-wide Ultimate standing in Bilging. Achieve ocean-wide Ultimate standing in Battle Navigation. Achieve ocean-wide Ultimate standing in Gunning. Achieve ocean-wide Ultimate standing in Carpentry. Achieve ocean-wide Ultimate standing in Navigation. Achieve ocean-wide Ultimate standing in Hearts. Achieve ocean-wide Ultimate standing in Rumble. Achieve ocean-wide Ultimate standing in Foraging. Earn the Ultimate achievement for every Piracy puzzle. Earn the Ultimate achievement for every Carousing puzzle. Achieve ocean-wide Ultimate standing in Spades. Achieve ocean-wide Ultimate standing in Distilling. Achieve ocean-wide Ultimate standing in Poker. Achieve ocean-wide Ultimate standing in Shipwrightery. Achieve ocean-wide Ultimate standing in Sailing. Earn the Ultimate achievement for every Crafting puzzle. Achieve ocean-wide Ultimate standing in Treasure Drop. Achieve ocean-wide Ultimate standing in Blacksmithing. Achieve ocean-wide Ultimate standing in Treasure Haul. Achieve ocean-wide Ultimate standing in Swordfighting. Achieve ocean-wide Ultimate standing in Weaving. Clear 1,000 crabs in the Bilging puzzle. Clear 5,000 crabs in the Bilging puzzle. Clear 100 crabs in the Bilging puzzle. Clear 20,000 crabs in the Bilging puzzle. Earn 20,000 grain bonuses in the Carpentry puzzle. Earn 100 grain bonuses in the Carpentry puzzle. Earn 5,000 grain bonuses in the Carpentry puzzle. Earn 2,000 grain bonuses in the Carpentry puzzle. Fill 10,000 cannons in the Gunning puzzle. Fill 1,000 cannons in the Gunning puzzle. Fill 250,000 cannons in the Gunning puzzle. Fill 100,000 cannons in the Gunning puzzle. Complete 10,000 constellations in the Navigation puzzle. Complete 100 constellations in the Navigation puzzle. Complete 2,500 constellations in the Navigation puzzle. Complete 1,000 constellations in the Navigation puzzle. Hit an opponent with 100,000 sprinkles in the Rumble puzzle. Hit an opponent with 20,000 strikes in the Rumble puzzle. Hit an opponent with 200 strikes in the Rumble puzzle. Hit an opponent with 1,000 sprinkles in the Rumble puzzle. Hit an opponent with 5,000 strikes in the Rumble puzzle. Hit an opponent with 25,000 sprinkles in the Rumble puzzle. Hit an opponent with 5,000 sprinkles in the Rumble puzzle. Hit an opponent with 1,000 strikes in the Rumble puzzle. Complete 4,000 targets in the Sailing puzzle. Complete 200 targets in the Sailing puzzle. Complete 40,000 targets in the Sailing puzzle. Complete 10,000 targets in the Sailing puzzle. Hit an opponent with 25,000 sprinkles in the Swordfighting puzzle. Hit an opponent with 5,000 sprinkles in the Swordfighting puzzle. Hit an opponent with 1,000 strikes in the Swordfighting puzzle. Hit an opponent with 5,000 strikes in the Swordfighting puzzle. Hit an opponent with 100,000 sprinkles in the Swordfighting puzzle. Hit an opponent with 200 strikes in the Swordfighting puzzle. Hit an opponent with 1,000 sprinkles in the Swordfighting puzzle. Hit an opponent with 20,000 strikes in the Swordfighting puzzle. Complete 50 expeditions for buried treasure. Pay your last respects to the Old Man from Oyster Island. Dig up 5,000 kilograms worth of chests from buried treasure atolls. Dig up 50,000 kilograms worth of chests from buried treasure atolls. Complete 200 expeditions for buried treasure. Complete your first expedition for buried treasure. Dig up 500 kilograms worth of chests from buried treasure atolls. Complete 10 expeditions for buried treasure. Successfully complete 50 Imperial outpost attacks in which your ship is at risk. Successfully storm an Imperial outpost. Successfully complete 200 Imperial outpost attacks in which your ship is at risk. Successfully complete 10 Imperial outpost attacks in which your ship is at risk. Successfully storm 10 Imperial outposts. Successfully storm 200 Imperial outposts. Successfully storm 50 Imperial outposts. Successfully complete an Imperial outpost attack in which your ship is at risk. Successfully complete 50 merchant hunt expeditions. Successfully complete 200 merchant hunt expeditions. Successfully complete 10 merchant hunt expeditions. Successfully complete a merchant hunt expedition. Complete 200 expeditions to salvage sunken ships. Complete your first expedition to salvage a sunken ship. Complete 10 expeditions to salvage sunken ships. Complete 50 expeditions to salvage sunken ships. Do the maximum possible damage to an enemy longship while on a Viking expedition. Successfully defend 10 settlements from a Viking attack. Successfully defend 50 settlements from a Viking attack. Successfully defend 200 settlements from a Viking attack. Successfully defend a settlement from a Viking attack. Participate in the sinking of 200 archelons in Atlantis. Participate in the sinking of 5 archelons in Atlantis. Win 5 swordfights against Atlantean saboteurs. Haul 50 chests out of the depths of Atlantis. Participate in the sinking of 200 triketos in Atlantis. Successfully storm 100 Atlantean citadels. Participate in the sinking of 5 triketos in Atlantis. Haul 6,250 chests out of the depths of Atlantis. Participate in the sinking of 1,000 gorgonyxes in Atlantis. Be aboard a vessel that sinks in Atlantis. Haul 250 chests out of the depths of Atlantis. Successfully storm an Atlantean citadel. Participate in the sinking of 1,000 triketos in Atlantis. Participate in the sinking of 1,000 archelons in Atlantis. Participate in the sinking of 5 gorgonyxes in Atlantis. Participate in the sinking of 200 gorgonyxes in Atlantis. Successfully storm 25 Atlantean citadels. Haul 1,250 chests out of the depths of Atlantis. Journey into the lost seas of Atlantis! Win 50 frays against Cursed Islanders. Forage 5,000 kilograms worth of chests from the Cursed Isles. Earn a rating of Frenetic while Foraging in the Cursed Isles. Set foot ashore one of the mysterious Cursed Isles! Win 500 frays against Cursed Islanders. Defeat Vargas the Mad while ashore in the Cursed Isles. Forage 500 kilograms worth of chests from the Cursed Isles. Forage 50,000 kilograms worth of chests from the Cursed Isles. Be aboard a vessel that sinks in the Cursed Isles. Win 5 frays against Cursed Islanders. Participate in the sinking of 1,000 ghostly frigates in the Haunted Seas. Haul 1,250 chests out of the depths of the Haunted Seas. Participate in the sinking of 1,000 ghostly brigs in the Haunted Seas. Participate in the sinking of 200 ghostly sloops in the Haunted Seas. Journey into the otherworldly waters of the Haunted Seas! Participate in the sinking of 5 ghostly sloops in the Haunted Seas. Haul 6,250 chests out of the depths of the Haunted Seas. Be aboard a vessel that sinks in the Haunted Seas. Exorcise 500 ship graveyards within the Haunted Seas. Haul 250 chests out of the depths of the Haunted Seas. Exorcise the ghosts from a ship graveyard within the Haunted Seas. Participate in the sinking of 200 ghostly frigates in the Haunted Seas. Participate in the sinking of 200 ghostly brigs in the Haunted Seas. Haul 50 chests out of the depths of the Haunted Seas. Exorcise 50 ship graveyards within the Haunted Seas. Participate in the sinking of 5 ghostly frigates in the Haunted Seas. Participate in the sinking of 5 ghostly brigs in the Haunted Seas. Participate in the sinking of 1,000 ghostly sloops in the Haunted Seas. Participate in a voyage and win a Sea Battle. 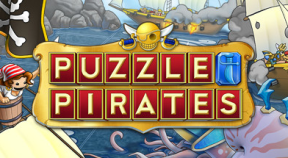 Welcome to Puzzle Pirates! Use an amulet to turn yourself into a skeleton. Celebrate a Sea Battle victory alongside (or as) a skeleton. Celebrate Sea Battle victories alongside 25 skeletons. Celebrate Sea Battle victories alongside 250 skeletons. Celebrate Sea Battle victories alongside 1,000 skeletons.